We consulted with Yelp to find out which places across the US whip up the best brunch. Gathering a group of friends together and going out to brunch has become many people’s go-to weekend plan. After all, it’s the perfect excuse to indulge in a thick piece of syrup-laden French toast and sip on mimosas or Bloody Marys midday. But then comes the question of where to go to find exactly which restaurant serves the best brunch. What do you do? Where do you go? In order to conquer such a difficult feat as pinpointing the best place for brunch in every state, we relied on the data team at Yelp to assist. Of course, no such list can be 100 percent exhaustive. All businesses considered for this metric had to fall within the “Breakfast & Brunch” category as specified on Yelp. They determined the best one in each state using an algorithm that assesses both the number of reviews as well as the star rating each business accumulated. Check out this list of the best brunch places in the U.S., and then make sure to hit up your state’s winning place to see just how worthy it is for yourself. The go-to brunch spot in Alabama is tucked away in the state capital. D’Road Cafe dishes up a lineup of Spanish delicacies including arepas, empanadas, and even criollo—a plate consisting of fried eggs, black beans, shredded brisket, plantains, one fried arepa, and the restaurant’s own magic sauce. Who wouldn’t want to go to a place called the picnic club? Girdwood Picnic Club satisfies all of your brunch needs with its diverse menu options. For example, for an earlier breakfast/brunch outing, you could sink your teeth into a sweet Pumpkin Cheesecake Waffle, or opt for a savory plate of sausage, eggs, and roasted potatoes called the Mountain Breakfast from 7 a.m. to 11 a.m. If a later brunch is more your style, the restaurant also offers three brunch items from open to close; the Breakfast Burrito, Good Morning Pita, and Veggie Tacos. Worth Takeaway is known for its impressive array of sandwiches, and we know it’s the real deal because of its over 580 reviews and 5-star rating. For a hearty brunch, opt for the Pastrami Croque Madame. It’s a French-inspired dish with slices of pastrami and cheddar layered between a swath of creamy Béchamel sauce and a drizzle of dijonnaise, all sandwiched between sourdough and topped with an over-easy egg. Tucked away in a patch of greenery in what appears to be a neighborhood in Eureka Springs is Oscar’s Cafe, the best brunch spot in Arkansas. This humble restaurant greets customers with a circular, royal blue sign that features an elephant walking between the “Oscar’s” and “Cafe.” Pop into this inviting place for refreshing peach bellinis, Bahn Mi sandwiches, and—for those with a sweet tooth—the Norwegian Waffle, a crisp waffle drizzled with Nutella and slices of banana. Did anyone else do a double take when they saw the words wine shop? Yep, this is the top-rated brunch spot in the state of California. One Yelp reviewer even calls it a hidden gem. This Sebastopol-based restaurant serves eclectic brunch dishes including Huevos Rancheros, Moroccan Vegetable, and a traditional Israeli breakfast called Shakshouka on Saturdays and Sundays. The Rolling Pin Bakeshop rolls out, you guessed it, a pile of pastries, cakes, desserts, and bread. From buttery ham and gruyere-filled croissants to a dessert called the Chocolate Mousse Dome, you’ll be sure to find something that pleases your palate at this famed Colorado brunch spot. Brooklyn Baking is the place to go if you have a hankering for something sweet. The company is especially known for its donuts, namely the Bavarian Cream and its selection of jelly donuts. The bakery also offers more satiating menu items such as the COMBO, which includes two eggs, potatoes, toast, and bacon or sausage. Russell’s Quality Food is dishing up brunch on wheels. That’s right, the best place to grab brunch in Delaware is a food truck! Russell’s whips up breakfast all day, with a menu comprising of different renditions of egg and cheese sandwiches. Do you prefer turkey bacon over pork bacon? No problem, they’ll be able to meet your needs. Not to mention, they also dish up egg and cheeses sammies with Italian sweet sausage. J28 Sandwich Bar is the Peruvian-inspired sandwich and specialty restaurant you never knew existed. Well, except for those who have visited or live in or around Hollywood, Florida. Floridians have the luxury of noshing on made-from-scratch empanadas, as well as a variety of Peruvian-style quinoa bowls, including the Quinoa Lomo Saltado/Beef Wok Stir Fry, which includes quinoa cultivated from Peru. There’s even a smoothie that’s made primarily from lucuma, a fruit native to Peru. Patrons who prefer following a vegan or vegetarian lifestyle in Savannah, Georgia, likely appreciate the brunch selections at Fox & Fig—a cafe dedicated to serving plant-based options. With mouthwatering dishes like Eggless Quiche, Soaked Chia Porridge, Cashew Cheese Garlic Bread, and Brambleberry Pancakes, even a meat-eater is apt to fall in love with this quaint cafe. Both Captain Cook and Kailua Kona, Hawaii, are home to the state’s best brunch spot. Menehune Coffee is named after the mythological, 3-foot-tall people that were believed to roam the deep forests and hidden valleys of the Hawaiian Islands. Legend has it the Menehune were very industrious and could conquer “mighty feats of engineering and construction overnight.” Learn about an island legend as you munch away on sweets like the Mauka bites, which are synonymous to honey-glazed granola bites made with dried fruits like cranberries, mangos, and nuts such as almonds and macadamia, and full-on meals such as omelets. The sun always rises when you’re in this cafe. Well, OK, while that may not be true, one thing’s for certain: You’re going to get a tasty meal. Ashton Sunrise Cafe is actually about five miles southwest of Ashton, and, according to one Yelper, the drive to the cafe is very scenic. Make a pit stop here for plates of pancakes and crepes named after Idaho-based landmarks Upper and Lower Mesa Falls, and biscuits and gravy dishes named after Tear Drop Lake. On Saturday’s at Bread Basket Cafe & Bakery, breakfast is served all day, which means that you can indulge in their custom Cinnamon Roll French Toast or Peppery Pig Omelette up until 3 p.m. Also, is it just us or does it look like this cafe is located inside of an adorable house? Would you believe that the most well-liked brunch place in Iowa is a spot that sells New York-style bagels? As the name suggests, 5 Borough Bagels dishes up bagel sandwiches that New Yorkers would fancy. On the menu, you’ll find options such as the Lox Deluxe, Sausage, Egg and Cheese on Bialy, and even a sandwich consisting of jalapeño cream cheese, ham, and fried onions called The Queens. The Depot is Kansas’ top spot for brunch, known for serving up American breakfast classics. Such comfort foods include a dish called the Main Railway, which includes two eggs, hash browns, and either a serving of bacon, sausage, or ham. Of course, no such breakfast platter is complete without a slice of buttery toast or a scrumptious muffin on the side. If you’re in the Leavenworth area, make sure to try this meal, or any of its others, for brunch! Would you like your Chilaquiles with eggs? No problem because Con Huevos (which is Spanish for “with eggs”) will happily add that onto literally any of its dishes if it’s not already included. Ten meals stack the restaurant’s brunch menu, including Chipotle Poached Huevos and even one called The Drunk Burrito. This beachy-looking shack will satisfy those hankerings for fresh seafood in the wee hours of the morning or mid-day. Liz’s Where Y’at Diner serves wicked egg scramblers, including one called The Bayou, which tosses Louisiana crawfish tails, onions, peppers, pepper jack cheese, and other ingredients in with three scrambled eggs. From cappuccinos with teddy bear art to avocado, egg, and cheese sandwiches Coffee ME Up has got all that you need for a quick and casual brunch. Not only is JJ’s Caffe the top place for brunch in Massachusetts, but it’s also one of Yelp’s top 100 places to eat in the nation. Run by a dynamic father and son duo, JJ’s Caffe pumps out high-quality brunch options, including Salmon Benedict and Crème Brûlée French Toast. With funky menu items such as Hippy hash and Dulce Banana Rhumba French Toast, it’s no wonder Deboer Bakkerij is a go-to for those living in or near the Holland area. Minnesotans really lucked out with this restaurant. Martina whips up an intricate menu of high-class meals, including smoked salmon with burrata on an everything bagel that’s topped with salsa verde and pepitas. Several Yelp reviewers rave about the almond flour pancakes and the potato churros, too. Hit up The Grind Coffee and Nosh if you’re in the mood for treating yourself to a Legendary Cinnamon Roll, buttermilk biscuits, and, of course, a soft egg, sausage, and cheese croissant sandwich. Lovers of BBQ, brisket, and chorizo in and around the Kansas City metro area are no doubt fans of Scott’s Kitchen. Pop in for brunch and order the Housemade Chipotle Ghost Pepperjack Smoked Sausage tacos for a spicy midday meal, or—if you can’t the handle the heat—opt for a milder dish, such as the Turkey Bern Street Burrito. According to Yelp, the number one spot for brunch in Montana is Main Street Eats. Reviewers applaud the Biscuits and Gravy, Cinnamon Roll French Toast, and their selection of ginormous omelets. Also, it’s only about a six-mile drive away from downtown Helena, so if you’re around the state capital, you’ll be within close proximity to this little gem. If you’re a fan of simple breakfast options such as breakfast burritos, croissant sandwiches, and yogurt parfaits, this humble little cafe is for you. Green Beans Coffee is run by an Air Force veteran and his wife, and they donate a percentage of their sales to organizations that support the families of those who have lost a loved one in combat. Gambling, glitz and glam, luxury shopping. These are just a few things that describe Las Vegas. Even the most determined tourists (and locals) need to refuel after hours of absorbing the intoxicating thrill of the city, and Zenaida’s Cafe happens to be the top pick for brunch in Nevada by Yelp reviewers. A favorite dish appears to be the Corn Beef Hash, according to reviews. Remember that as your stomach grumbles before hitting the town (or casino). New Hampshire’s own Tuckers has an exhaustive list of breakfast dishes ranging from Belgian waffles, eggs Benedict, frittatas, and skillets. The restaurant also whips up a side dish called Red Quinoa Hash Browns for those who are gluten-free to still be able to indulge in that crispy potato treat. Described as small and cozy by Yelp reviewers, JJ’s Diner has accumulated a perfect five-star rating and 405 reviews for its comfort food-centric breakfast dishes. The quaint town of Albuquerque is home to New Mexico’s top-rated brunch spot: 2G’s Bistro. This old-fashioned restaurant, with its clay-like walls, fits in well with the numerous historic Adobe structures amid the city, and it’s menu embodies the Spanish culture that lives within it. Try the Huevos Rancheros or the Southwest Benedict to get a taste of such Spanish/western flair. 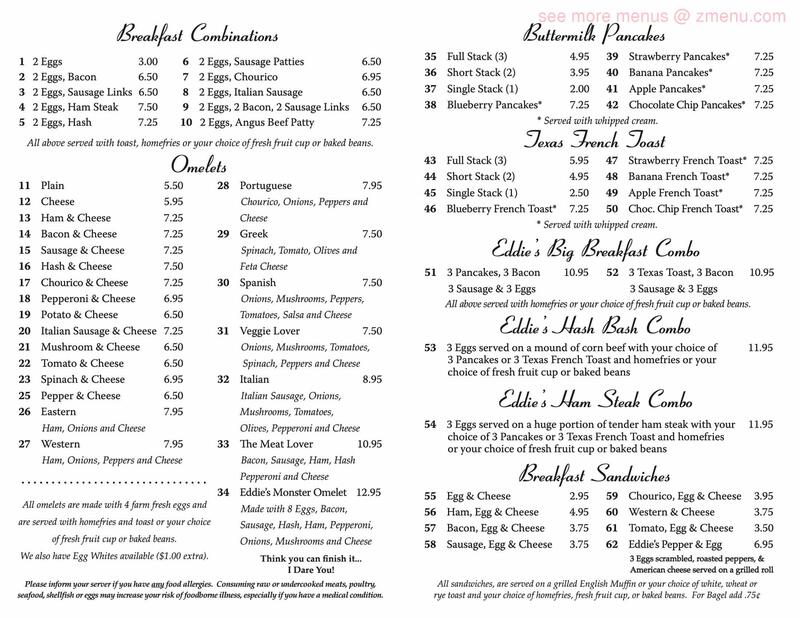 For one of the most affluent towns in the nation, it’s rather shocking that all of the breakfast items at the local restaurant are priced at under $15. Dottie Audrey’s Bakery Kitchen offers an extensive list of breakfast goods, including tartines and toasts, egg and meat-based dishes, and even a vegan chia pudding parfait. Is it just us, or does this restaurant almost look like it’s a hip bar? Not only is Savorez an aesthetically pleasing place to look at, but its brunch lineup is also pretty stellar. With options like Shrimp n Grits, Sam’s Green Eggs & Ham, and classic French Toast, the whole family is bound to find something they’re fond of. We get it, from the outside, Darcy’s Cafe doesn’t exactly reflect a chic brunch spot that you may see on Instagram. However, don’t judge a book by its cover! Reviewers rave about the corned beef hash, German sausage, and cinnamon roll pancakes. Dubbed, “The Best Little Cafe in Columbus, Ohio” is Scotty’s Cafe. A person passing through at first may be confused as to why this cafe is ranked as the best brunch spot in all of Ohio because it offers relatively standard lunch and breakfast items like a patty melt and a bacon, egg, and cheese sandwich. However, it’s the quality in which these classic dishes are prepared that makes Scotty’s unrivaled. The catch? The cafe is closed on the weekends, so you’ll have to get your brunch and breakfast fix during the week. Long weekend, anyone? Is it really any surprise that the best brunch spot in Oregon, according to Yelp, is located in the state’s trendiest town? While the food at Ovation appears to be amazing (it has garnered a 5-star rating and over 600 reviews), the selection of Moroccan drinks such as spiced coffee, pistachio latte, and mint tea, are what deserve a standing ovation. Don’t let the name of this place confuse you. Morgantown Coffee House is in fact located in Pennsylvania, not West Virginia. This charming little brunch location offers a seasonal menu and rotating coffee list, so for a place that never has the same items to be deemed the top brunch spot in the state says a lot about the quality of meals they churn out. Known for serving generous portions at affordable prices, Eddie’s Diner is the number one place to go to in Rhode Island for a delicious brunch. With five different flavors of buttermilk pancakes and Texas French toast and a whopping 23 omelet variations, even the pickiest eater will have a hard time not finding something they will enjoy. On Maple Street Biscuit’s website, it says, “We’re all about fresh, natural, and homemade.” And they’re not kidding. With biscuits made fresh in house every day, dishes cooked with only all-natural chicken, and homemade jams and jellies, this restaurant lives up to its word. Located right next to a Holiday Inn Express, El Columpio is the perfect place to grab brunch while visiting Mitchell, South Dakota. Yelp reviewers appreciate the great service, variety of menu options, giant portions, and reasonable prices. What more could you want? Crockett’s 1875 Breakfast Camp has more reviews on Yelp than any other brunch spot on this list at just over 1,000. This Yelp review may help explain why: “There are places that are so good that keep you awake at night trying to figure out when you can go again. Crockett’s is one of those places. So much so, that I truly believe it is the best breakfast I have ever had.” With many reviews similar to this one, it’s no wonder it’s the top brunch spot in the state. One of the more popular dishes is the meat lover’s Black Bear Camp Skillet, which consists of strips of pecan-smoked bacon, country or sugar-cured ham, sausage, and two eggs any style. Tacos for brunch? Yes, please! An adorable taco truck called Granny’s Tacos takes the title as the best place for brunch in Texas. Surprised? So were we. Apparently, their breakfast tacos are pretty tasty, and each one only costs between $2.50-$3.00. Granny’s Tacos also serves homemade salsas and made-from-scratch corn tortillas. Here’s how Cupla Coffee’s website describes its coffee selection: “Small single batch roastery serving different organic beans from around the world.” What’s more is that the cafe’s in-house bakery makes bread and pastries that those who follow a vegan, paleo, keto, and gluten-free diet can savor. Butler’s Pantry Breakfast is the restaurant that sits within one of New England’s most scenic mountain villages, available for a passerby to come in and spend the night. With dishes consisting of maple sausage, homemade biscuits, and even an açaí bowl, this little restaurant will satisfy all of your brunch needs. As the name of this place indicates, the menu at Simply Social Coffee is quite simple, with dishes labeled as straightforward as “Eggs and Breakfast Meat on Toast.” It’s described by reviewers as a cozy coffee shop with delicious pastries and small plates. Sounds simply amazing to us! Tibbitts @ Fern Hill may not look all that alluring on the outside, but the menu is stacked with good stuff. The breakfast looks especially delectable. One such menu item includes a dish called the Meat and Gravy Bomb, which is a savory plate that includes a hearty mix of herbed sausage gravy, scrambled eggs, potatoes, greens, pepper jack cheese, and candied bacon. The Grind is the place to go for maple lattes and kaiser roll sammies stacked with egg, cheese, and turkey. Burritos, old fashioned oats, scones, and Belgian waffles. That basically sums up the mouthwatering breakfast menu offered at this quaint coffee house in Wisconsin. At this place, you truly feel like you’re at home. Why? 5th and Jefferson was formerly a residential home that was converted into the popular coffee house it is today. Pop into Persephone’s Boulangerie & Cafe for avocado bowls, porridge, and even a plate called Rose Water Sweet Waffles. Of course, no brunch in the winter time is complete without a piping hot beverage. Select from a variety of warm drinks, including an anti-inflammatory turmeric latte or a tea and lavender-flavored latte called the London Fog. Now, it’s time to get brunching! This weekend, skip feeling over-stuffed! Who ever said you can't have tacos in the morning? Jumpstart your weight loss while in your PJs! Break free of your boring a.m. eats!